GarageBand is Apple's application for creating, editing, and just plain having fun with music on your Mac. This free download from the App Store works well with MIDI instruments, but if you don't have a MIDI keyboard, you can turn your Mac keyboard into a virtual musical instrument. Open GarageBand by double-clicking it in the Applications folder or using the Launchpad on the Dock. Select File > New from the GarageBand menu bar. In the upper left corner of the window that opens, choose New Project. Click the Empty Project icon in the central window and then select Choose in the bottom right corner of the window. In the pop-up window, select Software Instrument and click Create. Select one of the Pianos in the list of instruments in the panel on the left side of the window. A keyboard should appear underneath the window. If it doesn't, click Window > Show Musical Typing in the GarageBand menu bar to bring up the keyboard. The Musical Typing window shows the Mac keys that correspond to musical keys on the piano. The Musical Typing window also displays a keyboard above the keys, indicating which octave is currently active. This is the standard setup for playing the piano in GarageBand. 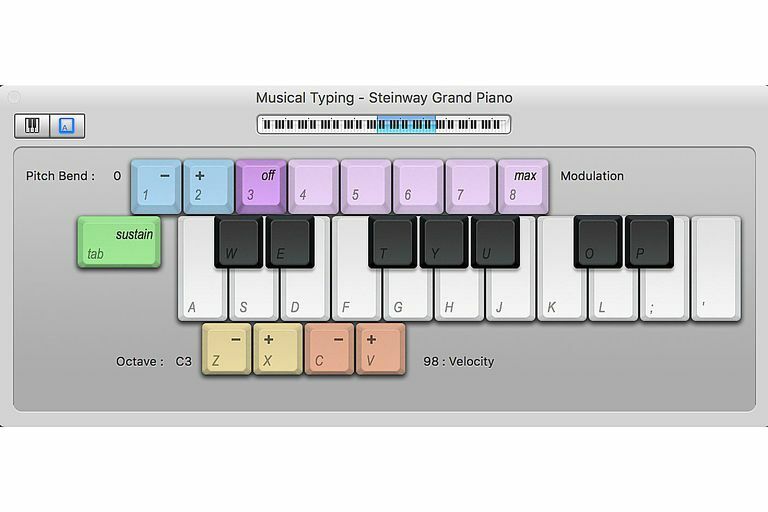 Play the onscreen notes by pressing the keys on your keyboard that correspond to the notes in the Musical Typing window or by clicking the keys with your mouse in the Musical Typing window. GarageBand plays the notes and records the track. The standard Musical Typing keyboard displays an octave and a half at any one time mapped to the "asdf" row of keys on a standard computer keyboard. Changing octaves is performed in one of two ways. Click the x key on the Musical Typing keyboard to move up one octave or the z key to move down one octave. Move multiple octaves by repeatedly clicking the x or z keys. The second method uses the representation of a piano keyboard near the top of the Musical Typing window. Select the highlighted area on the piano keyboard, which represents the keys assigned to the typing keyboard, and drag the highlighted section left or right on the piano keyboard. Stop dragging when the highlighted section is in the range you want to play. Besides the standard keyboard, you can opt to toggle to a piano keyboard with a five-octave range by clicking the keyboard icon in the upper left corner of the Musical Typing keyboard. This piano keyboard doesn't assign any of the keys to correspond to your Mac’s keyboard. As a result, you can only play this keyboard one note at a time, using your mouse or trackpad. This layout offers the advantage of a wider range of notes, and playing a single note at a time is helpful when editing works you create. GarageBand is available as a free download from the Mac App Store and from the App Store for iOS mobile devices. The iOS app has a touch piano keyboard option that works differently from the Mac version. If you have a MIDI keyboard, you can connect it to your Mac. When MIDI (Musical Instrument Digital Interface) was first developed, it used a 5-pin round DIN connector along with multiple cables to handle MIDI IN and MIDI OUT. These older MIDI interfaces have pretty much gone the way of the dinosaur. Most modern keyboards use standard USB ports to handle MIDI connections. As a result, you don't need any special adapters or interface boxes or special driver software to connect a MIDI keyboard to your Mac. Just plug the MIDI keyboard into an available Mac USB port. When you launch GarageBand, the app detects the MIDI device. To try out your MIDI keyboard, go ahead and create a new project in GarageBand, using the Keyboard Collection option instead of the Empty Project option. Once the project opens, touch a few keys on the keyboard; you should hear the keyboard through GarageBand. If not, reset GarageBand's MIDI interface, as follows. Select GarageBand > Preferences from the GarageBand menu bar. Select the Audio/MIDI tab in the Preferences toolbar. You should see your MIDI device detected. If not, click the Reset MIDI Drivers button. You should now be able to play your MIDI keyboard through your Mac ​and record your sessions using GarageBand.